On the look out for easy to use, one touch commercial bean to cup machines? 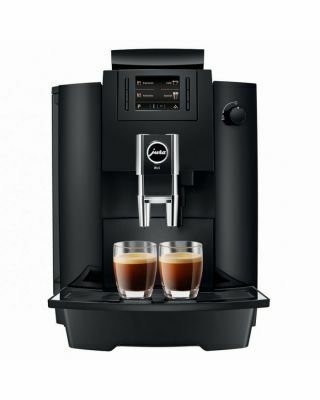 Trust the designers of Jura coffee machines to bring you a wide range of beverage solutions that are ideal for restaurants, cafes, hotels and offices. 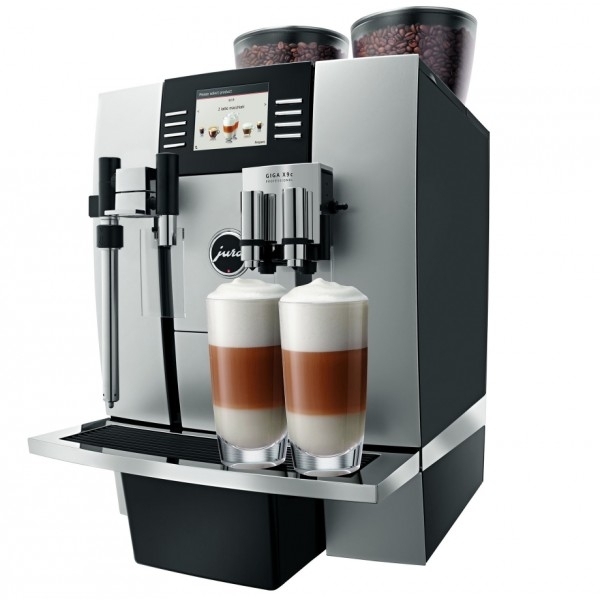 Producing beautiful drinks using real beans and fresh milk, you can expect to serve a fantastic selection of popular drinks such as espressos, americanos, cappuccinos and lattes, all prepared at the touch of a single button. 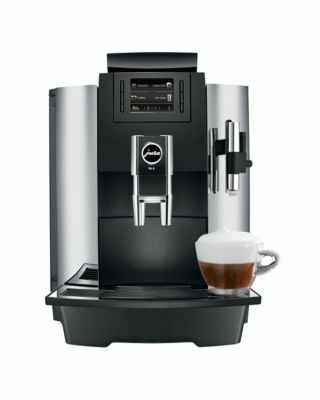 These coffee makers are especially popular at sites where you want to produce high-quality beverages using fresh coffee beans and real milk, but don't have the time to train your staff traditional barista skills. They are ideally suited for establishments with a high turnover of staff, or as an office coffee solution. Very little knowledge is required to operate bean 2 cup machines and the quality of beverage is very good. Milk flushing - Takes a few minutes but required at least once a day. Tablet internal cleaning - Bean to cup machines are self-cleaning; this task takes 15 minutes and should be done every 200-300 drinks. De-scale - Very important. This takes 40 minutes. Depending on the usage and quality of your water, this should be done between every 2 weeks to twice a year. We'll give you an estimate on how often your machine will require this cleaning programme based on your postcode and daily drinks served. Is your machine for commercial use? If so, don't be tempted to save money and purchase a domestic machine. For the choice of drinks you require, entry level machines will offer less choice than the larger coffee machines. Read our full guide to choosing a coffee machine for further information. How many coffees a day are required? Don't get too hung up on this as it's often difficult to estimate, particularly if you are setting up a new business. The kit will physically produce more than the daily average on a busy day, but the daily usage guide will point you to the right machine for you. Daily usage as a guide: 1. Domestic (20 cups per day), 2. Entry level commercial (25-30 cups per day), 3. Light/medium use (50-100 cups per day), 4. Medium/standard use (100-200 cups per day), 5. Super-automatic or heavy use (100 cups per hour). Jura Impressa is the best-known bean 2 cup manufacturer in the world. 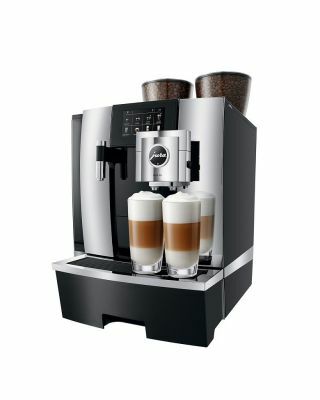 Swiss-engineered, the Jura coffee machine collection offers a wide range of commercial coffee machines, including the Giga range. 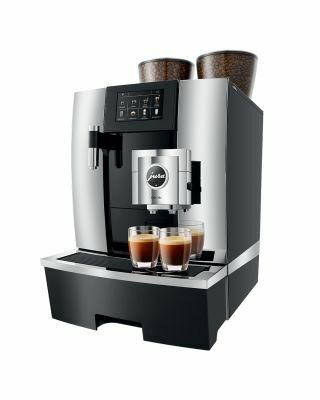 Recent new launches include the Jura Giga X3 and Giga X8, machines that are really simple for the operator to use and clean, 200 drinks per day and an extended 3 year warranty.